Professor P. W. Epasinghe, whom I know well, and who is currently among other responsibilities, also functioning as the Chairperson of the D. A. Rajapaksa Memorial Commemoration Committee, sent word requesting me to write something for the forthcoming commemoration publications. I told the gentleman who contacted me on the Professor’s behalf, that I have never had nor at present have any political affiliations of any kind, and that therefore I won’t be a proper choice to write such an article. To this, I received an interesting reply. I was informed that they would like to see more uncommitted people write, because those who are committed tend to write panegyrics. What they wanted to see were different perspectives and to the extent possible a different approach. It is in this light that I have made an attempt, although I have reservations about my qualifications to do so. There are many interesting aspects to the life of Mr. D. A. Rajapaksa. He was born in 1905. He was born into the twentieth century, a century that saw so much progress as well as so much turmoil and bloodshed in the world. The accelerating development of science and technology, rapidly being allied to entrepreneurship and capital improved the quality of life in an exponential manner. At the same time, these very developments were diverted towards expanding and enhancing destruction. In countries like Sri Lanka, by now centuries into the painful experience of different varieties of colonialism, malnutrition, poverty and apathy predominated. It was into such a milieu that Mr. Rajapaksa was born, essentially a rural Buddhist environment. He entered a government school in Weeraketiya, his village and from there went on to Richmond College, Galle, one of the leading schools in the Southern Province, and the island. There, he obtained a wider exposure and experience. After his initial exposure to the village verities of Weeraketiya; he was now in a high quality provincial school of national stature. Mr. Rajapaksa, while pursuing his studies, also found the time to captain the school soccer team and play for the school cricket team. Cricket and soccer are two excellent team sports that build character and provide great experience in enhancing inter-personal relations and leadership qualities. Even in school, Mr. Rajapaksa, as well as his brothers, displayed strong characteristics. For instance, they rejected the use of forks and spoons at the college dining table and chose to eat with their fingers. This, with other patterns of behaviour, were early indications of an anti-colonial and radical attitude. After completing his fomal education, Mr. Rajapaksa went home to pursue two passionate interests, working for the welfare of the community, and farming. He was adept at the art and science of agriculture and loved getting into the fields and being at one with nature and the soil. Mr. Rajapaksa did not initially show any great political interest personally. He however helped his brother, Mr. D. M. Rajapaksa in his political campaign to enter the Second State Council. This turned out to be a very successful effort, with Mr. D. M. Rajapaksa being elected as the member for Hambantota in 1936, by a majority of over 12,000 votes. Such was the state of affairs, when destiny intervened. In 1945, Mr. D. M. Rajapaksa became suddenly ill and passed away. Now came a popular demand for Mr. D. A. Rajapaksa to contest the vacant seat. The records show that he was not interested. He was a farmer. He loved farming. He was loathe to leave such a congenial occupation for the uncertainties and sometimes unpleasantness of competitive politics. But the public demand continued. Mr. Rajapaksa chose not to hear it. Then comes a most colourful episode, an episode perhaps unique in the history of politics. The people of the area who were determined to nominate Mr. Rajapaksa for the election, went down to the paddy field where he was ploughing, and obtained his signature on the nomination paper! The wisdom of the people was justified. He was elected uncontested and took his seat in the State Council in August 1945. In the State Council, which was run on the basis of several committees, Mr. Rajapaksa naturally chose the agriculture committee, which was then chaired by Mr. D. S. Senanayake. Mr. Rajapaksa now pursued his political career, a career in which the people took him out of the paddyfield and placed him in the State Council. At the Parliamentary General Election held in 1947, Mr. Rajapaksa was elected from the Beliatta seat to the first Parliament of independent Ceylon. 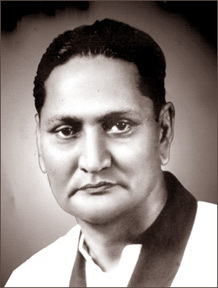 Then followed the high drama of July 12, 1951, when Mr. S. W. R. D. Bandaranaike, a senior member and minister of the United National Party, crossed the floor of the House to sit in the Opposition benches. Just one other person followed Mr. Bandaranaike that day, Mr. D. A. Rajapaksa. It was by any standard, an act of great political courage. This was no crossing from an Opposition to a functioning Government. This was no crossing in order to obtain perks of office. It was a different crossing, a crossing from the known into the unknown, one from the comforts of office into a future clouded with uncertainty and perhaps political suicide. Mr. Rajapaksa, then became a political pioneer. The Sri Lanka Freedom Party was just as much his creation. The political history of the country was altered forever. Sri Lanka saw the emergence of a two party system. The people had a wider choice. Ideas, attitudes and ideologies which were not represented elsewhere were represented here. The democratic framework was broadened and deepened. Different policy choices were now available to the people, and competitive Parliamentary and later Presidential democracy built a welfare state of substance with human development in the forefront. This is not a place to debate the dichotomies between welfare and development. These are issues that will have to be continually addressed by our political parties and resolved in a practical manner. But what is of real importance are the watersheds of 1951 and 1956 and 1951 led to 1956 and beyond and the lonely courage shown by Mr. D. A. Rajapaksa in July 1951 is a signal and singular act in the political history of Sri Lanka. Mr. Rajapaksa held high office. The various positions he held included that of Deputy Minister, Minister, Chairman of Committees in Parliament and Deputy Speaker. He used these positions and his growing influence to initiate action on many aspects of agricultural development; his first love. These included the multipurpose agricultural development scheme under the Walawe Ganga Development Project which benefited the people in and around Embilipitiya and the small tank development Muruthawela Reservoir scheme. His leadership in the setting up of the paper factory in Embilipitiya capable of using a by-product of agriculture, hay as a raw material and his work in developing the handloom textile industry and the crafts sector involving gold, silver and brassware are universally acknowledged. Ayurveda was another subject close to his heart and he did much to establish dispensaries and hospitals of indigenous medicine. In the field of religious activity, he became seriously engaged in assisting temples and pirivenas and catering to the welfare of the Sangha. He did much travel by bus including using public transport to come to Colombo, a practice unbelievable in the present context. If we are to sum up the totally of life and career of Mr. D. A. Rajapaksa, what emerges is that of a simple unostentatious person rooted in village values, passionately interested in agriculture and all matters connected with it; a responsible legislator, minister, social worker and community developer. Added to all these was the display of the courage of his convictions by choosing to go to what might well have been the political wilderness when he chose to cross the floor of the House along with Mr. Bandaranaike. He thereby, above all, contributed to the formation of a political grouping of signal importance in the ensuing history of the country.